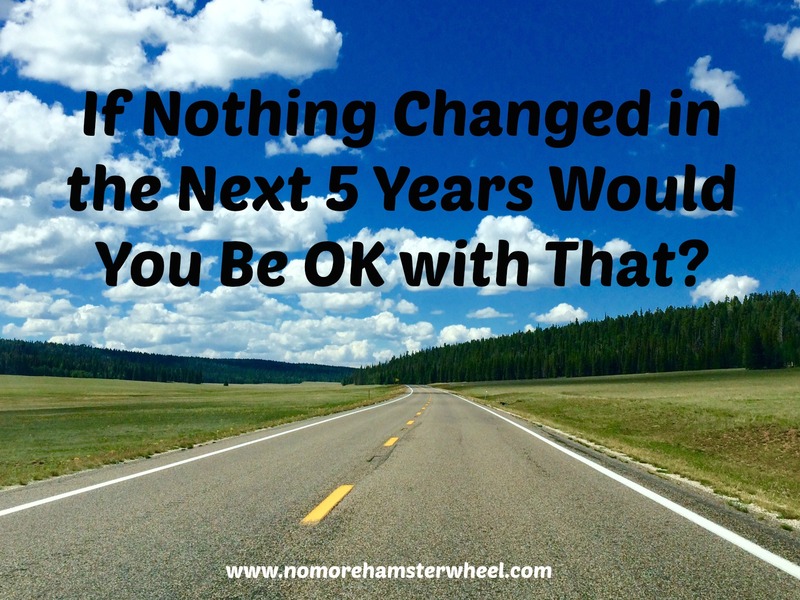 If Nothing Changed in the Next 5 Years Would You Be OK with That? How do you want your life to look like 5 years from now? That’s not always an easy question to answer but it should be if we really spent some time thinking about what we would want that answer to be. Would you be okay if your life was exactly the same 5 years from now as it is today? Two different questions. Both with the same intent. Why is it so hard to envision our future? I personally think it’s because we are not breaking our life into components but rather looking at it as one piece, which then becomes overwhelming. So what to do if you have trouble envisioning your preferred future? Break your life into the Wheel of Life components. There are many versions of the Wheel of Life but they traditionally consist of Career, Financial, Social, Family, Personal Development and Spiritual. Ask yourself where would you like to be in 5 years in each of those areas? How do you want to spend your day working? Where do you want to be financially? How much time off do you want to have? Family? Friends? Travel? By breaking our life into components we can decide where we would like to be and then we set goals and start working towards those. All the individual pieces become your life so after you create your ideal future in each sit down and see how they all fit together. If there is imbalance see which area may need some tweaking until you have them in unity. What can you do next to ensure you are where you want to be 5 years from now? Answer in the comments. Need help? I offer affordable individualized coaching. If you are interested in getting help with setting goals for your future let’s chat to see what I can do to help you. See the Coaching Tab for more information. NO WAY would I want my life the same as it is now!! I’ve got plans BIG plans!!! Be gone from the USPS!! My wife and I taking a cruise(s). Steve recently posted…#19 We were formed into a company. You (and Kevin Buchanan) inspired me to put together my own #next5 financial goals. It was a really good exercise to see that I am actually a lot closer to some of my goals than I thought. Thanks for the inspiration! Awesome Kristin! It’s great that you are a lot closer to your goals than you originally thought. You are doing some amazing things! Good stuff! Thanks for turning that phrase around. It certainly makes me think differently. It forces me to answer ‘yes’ or ‘no’, and I have to say ‘NO’! Now the challenge is to look at what I want to be different and how to get there. Thanks Rick. Yes, turning that phrase around truly changes our perspective. I’m glad your answer is NO and now you can find ways to get to where you want to be.